I was lucky enough to win an AX Paris goodie bag in etailPR's giveaway, and one of the lovely prizes was a Barry M Matte Nail Paint in the shade 'Mocha', an unusual (for nail polish) mid-brown. These photos show two coats with no base or top coat, and I have to say this was a pleasure to apply; it went on smoothly and easily, drying quickly to a lovely matte finish. I'm not 100% sold on the colour as I don't think it's quite right for my skintone, but I can't deny it's a lovely nail polish and I'll definitely be picking up a couple of other shades from Barry M's Autumn Mattes range - I've got my eye on the gorgeous deep burgundy of 'Crush'! In the photos, the left are in natural light and the right are with flash, which shows the colour a bit more true-to-life. Do you own any of the new Barry M Matte nail paints? What do you think of brown nail polish? 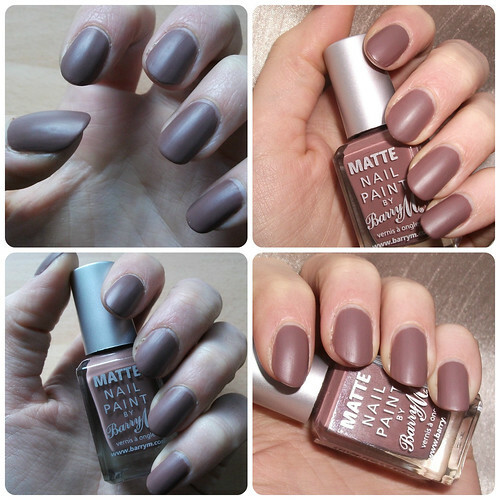 Are you a lover of matte nails? I have the berry one from this range and love it, they're beautiful! Ooh I've not seen much of this range before but it looks really good. I quite like the look of matte nails and I'm even surprised by how lovely this colour is, wouldn't usually go for a brown polish but it's perfect for this season! Wow it looks great I've never found a nail varnish that has claimed to me matte before which actually lives up to its claims. I think I shall have to check this line out. This looks really nice! I was never sure of matte nails as I was afraid they would look like poster paint but these look lush.